Listen to Pat talk about how this ICHWC Review Class can assist you in preparation for the ICHWC Exams. As a certified Health and Wellness coach and coach trainer, Pat is experienced and serves on the ICHWC Advisory Board representing MentorCoach. Pat will highlight the Blueprint for the exam, additional resources recommended by the ICHWC and assist individuals interested in taking the ICHWC National Credentialing Exam (in November, 2018 or sometime during 2019) to be prepared with more confidence. This review course is designed to assist all students who have achieve MentorCoach’s Wellness Certification regardless of when they took courses or who the faculty member was in the past. Individuals taking this course will receive a MentorCoach Health and Wellness Certificate upon completion. Also, be advised that some of the requirements to take the national examination will be changing in January, 2020. 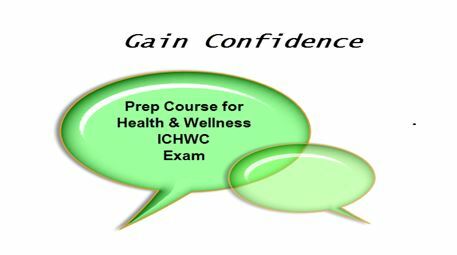 So if you have finished with Health and Wellness classes or planning to be finished sometime in 2019, you may want to enroll in this ICHWC prep course now! Coming soon. REVIEW COURSE for ICHWC EXAM: This Review Course (requested by many Health and Wellness Coaches is a seven-week learning experience (only four 90-minute classes) that are designed to prepare current MCP Certified Wellness Coaches for the International Consortium for Credentialing of Health and Wellness Coaches (ICHWC) exam. Review the Blueprint (content outline) in order to improve your confidence as you prepare for the ICHWC exam. Identify additional resources needed for review to enhance knowledge and preparation. Identify gaps in learning that may have occurred for those individuals who may have taken health and wellness classes PRIOR TO MentorCoach becoming affiliated with the consortium and the development of the national/international examination. Provide information regarding the type of questions anticipated on the ICHWC exam and strategies for remembering data elements and test-taking. Offer an opportunity for Questions and Answers regarding process and content related to the ICHWC exam. Classes are designed to review content outline and highlight additional resources that may have been identified during this past year (at ICHWC). In addition to the content review, this course will provide information regarding the type of questions that are designed to test knowledge, and within each 90-minute class, to allow approximately 30 minutes for Question and Answers. We’ll start by reviewing the ‘coaching competencies’ that are evaluated AND how they apply to health and wellness coaching situations, then explore the ICHWC code of ethics and scope of practice information. Finally, we will discuss any questions regarding the logistics of the actual test taking including what is allowed in the test-taking facilities and expectations. Week #1: Overview of the Examination including Blueprint (Outline). During this class, Coaching Structure and the beginning of the Coaching Process applied to Health and Wellness coaching will be presented and discussed. Specific references will be highlighted that support this section of the ‘blueprint-outline’. Time is scheduled for Q & A. Week #2: Coaching Process specific applications related to health and wellness will be presented and discussed. During each session, reference will be made to the resources available and applicable to tailoring coaching practice to health and wellness coaching. Time is scheduled for Q & A. Week #3: Health and Wellness specific content and resources will be discussed in detail – specifically related to the Healthy Lifestyle Basics. Time is scheduled for Q & A. Week #4: Health and Wellness Code of Ethics, Legal and Scope of Practice with examples (case studies) for application. Again, time is scheduled for Q & A. You will learn/review specific knowledge related to your coaching knowledge and competencies to the blueprint (content outline) for the examination which has been established by the ICHWC. You will experience examples of case studies and how you would apply the health and wellness coaching competencies, code of ethics and scope of practice in preparing for the examination. Finally, you will have an opportunity to review other resources (reading materials, web sites from the Healthy Lifestyles resources, etc.) that will assist you in preparing for the examination. You’ll walk away from this class with a stronger appreciation of the resources that will assist you in preparing for the national examination. Also, you will better understand the code of ethics and scope of practice (only recently approved by the ICHWC). By the end you will be prepared for any uncertainties you may have and be more confident going into the examination. You will end this review with a ‘health and wellness coaching tool kit’ that will not only help you with the examination, but give you ‘ready resources for your coaching practice and your clients’. This class is designed to assist MentorCoach Certified Coaches to better prepare for the ICHWC examination. Since the inception of the Wellness Certification specialty at MentorCoach, there have been changes in course content and faculty teaching the classes. This has also occurred in many other programs that have joined the ICHWC and received program approval. Consequently, any individuals who may have taken classes prior to MentorCoach being approved as a transition program (April, 2016 and beyond) may need to have some resources and content updated . Of course, much of this material is listed on the ICHWC site at www.ichwc.org. However, the final content outline, writing of test items (late fall, 2016 – 2017 & 2018) and finalization of the test items did not occur until March, 2017, so the ‘Blueprint’ that was used as a guide for developing questions for the examination was not available for individuals who completed our program prior to that time and more recently. Be assured that most of the content you will recognize, however different programs use different resource material(s) and our intent is for you to have everything you need to increase your preparation and confidence going into the exam! Background: During the time that MentorCoach has offered this emerging area of specialized coaching practice, the former consortium, the National Consortium for the Credentialing of Health and Wellness Coaches (NCCHWC,) was created and work began on the development initially of a national examination. This organization is now the International Consortium for Health and Wellness Coaching (ICHWC) and many MentorCoach former Health and Wellness certified coaches have passed the exam and are now NBC-HWC certified. After the development of the original consortium, MentorCoach became affiliated (by Patricia Hinton Walker serving on the Advisory committee). Then, when the opportunity for transitional approval of programs providing Health and/or Wellness certification became available, MentorCoach’s program was rapidly approved by ICHWC in April, 2017. This is open to who have achieved health and/or wellness certificates and are planning to sit for the ICHWC examination in 2018 or 2019. This course is also appropriate for individuals who just want to enhance their Health and Wellness coaching knowledge, including those who have taken health and wellness coaching classes and may be considering taking the ICHWC exam in the future. Also, since many of our MCP coaches were engaged in wellness coaching before we became involved in the early stages of the National Consortium for the Credentialing of Health and Wellness Coaches (originally NCCHWC), they received a ‘wellness certification document’. Since we are qualifying our coaches now as ‘Health and Wellness Coaches’, if you are one of our early graduates from the program, after completing this review course, you will also receive a “Health and Wellness” certification document. Additionally, the requirements for the exam may change for January 2020, so MentorCoach Health and Wellness coaches who are thinking about taking the exam in November 2018 and/or one of the dates in early 2019, may want to consider taking this course now. This course is an exam prep course and, of course, does not count toward MentorCoach or Health and Wellness certification. Patricia Hinton Walker, PhD, RN, FAAN, MCC, CBCC, NBC-HWC is an accomplished coach and ICF Coach Trainer at MentorCoach LLC, Bethesda, MD. She provides leadership for the Health and Wellness Coaching Certification program at MentorCoach. Pat is one of the few approved, certified Body-Centered Coach Trainers who integrates this content into health and wellness coaching. She is creative, experienced, brings life and humor to teaching/training while focusing on use of evidence-based coaching strategies with extensive online education/training experience. Pat serves on the ICHWC advisory council representing MentorCoach, LLC and has submitted questions for the national certification exam that is being planned by the ICHWC. Additionally, she teaches Foundations (a 31-week course focused on the ICF core competencies) with application of Positive Psychology to PCC-level coach training. Pat is certified in wellness (CWC), executive (CEC), body-centered (CBCC), social-emotional intelligence coaching, and also holds the ICHWC national certification (NBC-HWC). She is recognized as a leader in the use of mHealth (mobile health) data for just in time evidence for health behavior change with an eye on the future use of population health data that can be used to improve health and wellness in businesses and organizations in addition to individual coaching.